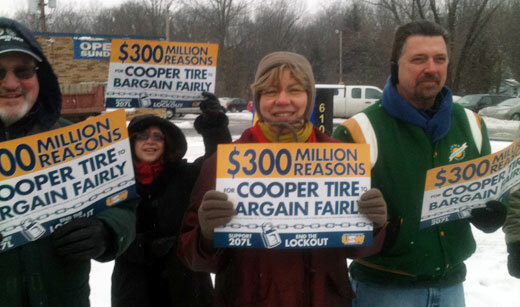 CLEVELAND – “Corporate greed at Cooper Tire is flat out wrong!” That was the message brought by pickets at over 100 retail tire stores in the U.S. and Canada Saturday, Jan. 14, protesting the lockout of 1051 workers by Cooper Tire and Rubber Co. at its plant in Findlay, Ohio. Thirty of the protest actions took place in Ohio, including five in Findlay, a town of 41,000 residents 50 miles south of Toledo. In Cleveland, two dozen protesters stood on a snow-covered sidewalk in front of a National Tire and Battery store. USW leader Pat Gallagher took in a delegation, promising to end picketing if the manager would sign a letter to Cooper’s top executives. 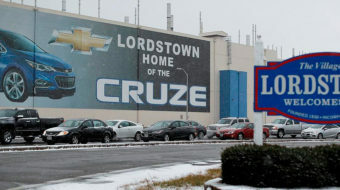 The letter voices concern about the lockout and its effect on product quality and urges a resumption of “meaningful bargaining.” The manager said he would refer the letter to his district manager. Local 207L had already made $31.2 million in concessions in the 2008 contract negotiations helping the company make $448 million in operating profits and $360 million in pre-tax income. The union workers average $23 an hour, Gallagher said. But, according to the U.S. Survey of Manufactures, production workers in Ohio generate over five times that amount – $130 – every hour. That means in a five-day workweek, tire workers create the value of their wages in one day and for the next four days create wealth for the company effectively without pay. That is how Cooper got its massive profits and was able to pay its five top executives more than $9.5 million in salaries and purchase a new corporate jet. As taxpayers, the Cooper workers also contributed to the millions the company got in city and state grants, abatements and subsidies. That included three years of an estimated $900,000 worth of free water from the city and $2.5 million in state grants to increase worker productivity and skills. But Cooper is not satisfied. It wants to squeeze more out of its labor force, not only demanding cuts in wages and benefits but also the right to employ non-union temporary workers. When the workers balked, the company locked them out and brought in scabs. 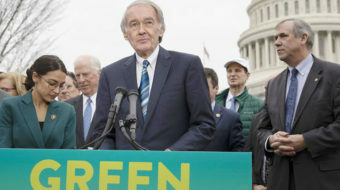 This is the true face of corporate class warfare, which their mouthpieces hypocritically denounce whenever working people ask them to pay their fair share in taxes and act responsibly towards the communities where they operate and the workforce that creates their profits. The Steelworkers are fighting back: organizing rallies, food banks and broad community and international labor support. All last week a delegation of locked out workers met in Serbia with leaders of Nezavisnost, the union representing workers at Cooper’s recently purchased facility in Krusevac, to discuss mutual support. When the plant was bought in September, Nezavisnost sent a letter to the company demanding an end to the lockout and pledging support for Local 207L. Unite the Union, representing Cooper workers in Melksham, England, also pledged support. 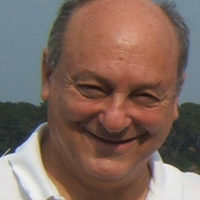 The company additionally has plants in China and Mexico with worldwide sales of $3.4 billion and employment of 13,000. The Steelworkers have set up a website: www.stopcoopertire.org, where supporters can sign a petition to the company and make donations to help the locked out workers. The union is also in contract negotiations with Cooper at the company’s plant in Texarkana, Arkansas. Cooper’s third U.S. tire plant in Tugaloo, Miss., is non-union. Pictures of the Findlay rally are available here. 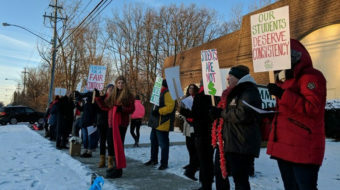 Video made by the Findlay Courier with interviews of locked out workers who formed a “Human Chain of Solidarity” Dec. 5.